It’s true, Lightning Lad never appeared in the Norseman. 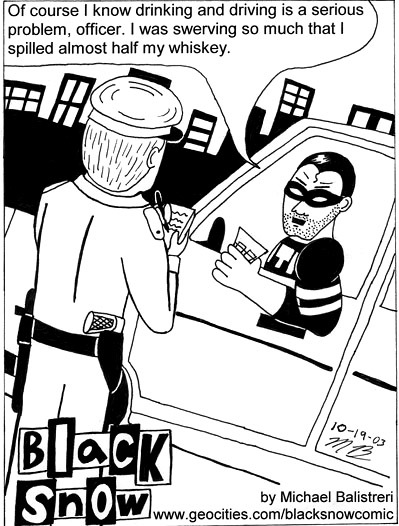 When I, Michael Balistreri, was asked to do a comic strip for the bi-weekly West Valley Community College school paper, the Norseman, I thought, “Why not a Black Snow comic strip?” The strip features characters from the comic books, but that is the extent of their connection to the Official Black Snow universe. It is written without the aid of my partner Alex and does not fall into the official chronology of the comic books. With that being said, enjoy the comics. 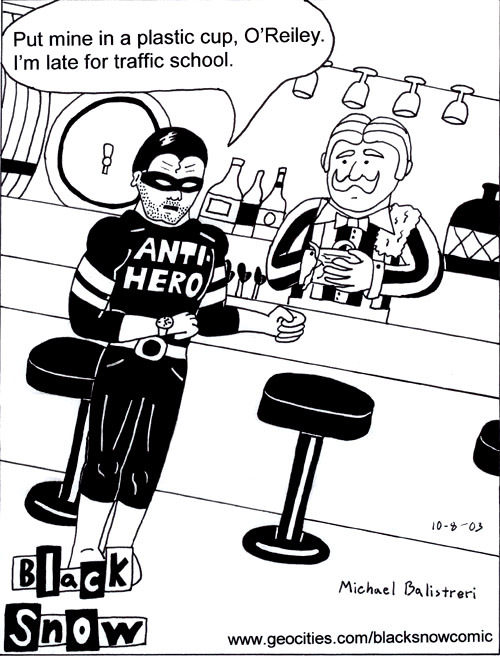 This first comic originally appeared in the October 16, 2003 Issue 49 of the Norseman. The joke is based on a real life incident witnessed by my uncle at an Elks Lodge bar. This special Halloween comic originally appeared in the October 27, 2003 Issue 50 of the Norseman. This Public Service Announcement also originally appeared in the October 27, 2003 Issue 50 of the Norseman. It was made as part of an English class group project to make a fallacious ad. How many fallacies can you count? Why would you want to? Definitely the goofiest depiction of Black Snow to date. I believe this comic appeared in the Issue 51 Norseman, but can’t recall the date as I can’t seem to locate the edition at this time. Good stuff here. This may be my favorite one. And in case your wondering, yes I do advocate drinking and driving. Here is a comic that appeared in the November 27th Issue 52 of the Norseman. Some found it very funny, it left some scratching their heads, and many said they agreed. This comic also appeared in the November 27th Issue 52 of the Norseman. A little more beer humor for you. What variety and brilliance I demonstrated with my brief run in the comic strip spotlight. Unfortunately my time with the Norseman was brief, as I chose to stop doing the comic strip after only a single semester. You may see the return of the comic strip one day, but it won’t be for that little hick paper because I’m not sure it even exists anymore and I don’t go to school there anymore. Is this the end of the comic strip? Only time will tell.